We have many customers requested advice on the best available option to achieve a very small branding woven label design. These customers have been searching and have enquired many other label manufacturing companies but still haven’t had much luck. And they are getting rather frustrating going around in circles. One particular customer is a couture fashion designer who likes to brand all their creations with a unique signature seal of approval. But one of these designers’ main problems is trying to brand some of the smaller design pieces that don’t have enough room to fit their current sized label on. 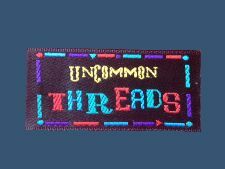 The sort of dimensions small branding label customers are looking for with this smaller design woven label is Width 10mm x Length 10mm. At the point, this customer is beginning to wonder whether maybe this could be achieved with a woven or embroidery badge making method. And voila! Perfect Labels Lanyards is the one-stop woven labels supplier to offer all weaving solutions. We successfully created a very tiny weaving image on 1 cm woven label dimension; clear high-definition weaving image, unique and strong brand identification. How small can we achieve? Have a look at these very small woven label images. We apply digital high-definition weaving method to achieve small weaving images; we use very thin thread to create small and smooth weaving images and texts. It looks almost like a printing image, but it is not, it is a woven label. Apart from this amazing digital HD weaving solution, we request customer to design their text with at least 2.5mm in height & width to get a clear and legible weaving image. Read our customer review here.